M101 ULX-1 is an ultra-luminous x-ray source in the Pinwheel galaxy (also known as M101). 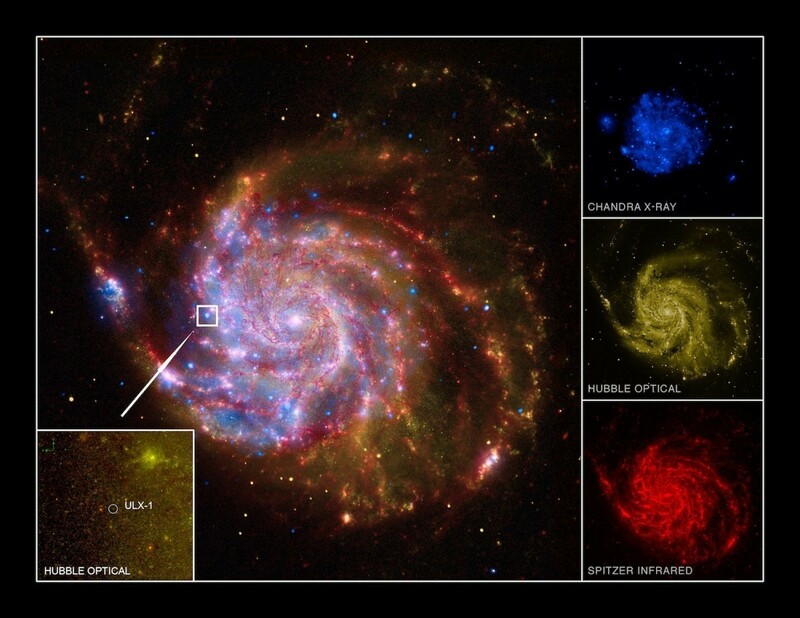 As you can see in the image above, while it is quite bright at x-ray sources, it is not nearly as bright at visible and infrared wavelengths. For this reason it was suspected that ULX-1 might be an intermediate mass black hole. It seems that black holes tend to come in two sizes, stellar-mass sized (formed from the death of a star) and supermassive ones (found in the centers of galaxies). You would think that there would also be intermediate mass black holes. That is, stars that are between 100 and a 10,000 solar masses. They should be out there, but so far we don’t have a lot of solid evidence for them. Given the brightness of this particular x-ray source, it could be due to an intermediate mass black hole that is accreting matter. Now a new paper in Nature (paywalled) demonstrates that it isn’t an intermediate mass black hole after all. Ultraluminous x-ray sources such as ULX-1 can vary in intensity, and the team observed the source during a low x-ray period, hoping to learn about the companion star that is the source of accreting material. Through their observations they were able to determine spectral lines from the companion. They found that it is rich in helium, but has very little hydrogen. This is indicative of a Wolf-Rayet star. A Wolf-Rayet star is a star with an extremely strong stellar wind. They are old massive stars on their way to becoming supernovae. Their brightness is clearly dependent on their mass, so we can gauge the mass of a Wolf-Rayet star by its brightness and spectra. In this case the star has a mass of about 19 solar masses. Knowing the mass of the companion, we can then get an idea of the mass of the black hole. The team found that the black hole likely had a mass of 20 – 30 solar masses. This is well below the range for an intermediate mass black hole, so this is just a large stellar mass black hole. So hopes of finding an intermediate mass black hole are dashed once again, but the results do give us something very interesting. This black hole is able to become ultraluminous by accreting material from the solar wind of the Wolf-Rayet star. It was thought that such an accretion was too inefficient to give the kind of extreme luminosity that we see. We now have strong evidence that the accretion process is very efficient. Just how that is possible is a puzzle for another day. Paper: Liu JF, Bregman JN, Bai Y, Justham S, Crowther P. Puzzling accretion onto a black hole in the ultraluminous X-ray source M 101 ULX-1. Nature. 2013;503(7477):500-3.